Andra våningen i byggnad utan hiss. 1 sovrum, 1 badrum, vardagsrum med öppet kök och balkong. Rum: 2 enkelsängar på 90 cm. Med utvändiga fönster på gågatan. Kollektivtrafik i närheten. Plaza España Intermodal Station (buss, tunnelbana och tåg) 1 km. Slutstädning är obligatorisk och ingår ej i hyran. Freedays har ett professionellt städlag. Du kan välja mellan betalningen i början av vistelsen eller i slutet av kontraktet. Vi ber att du lämnar lägenheten i gott skick, lämna inte skräp och rena skålar. Dessa betalningar kommer att regulariseras i slutet av kontraktet, med den faktiska konsumtionen som görs i hemmet genom att läsa mätare. Spent a week here and enjoyed our stay very much. Apartment has everything you need to stay comfortable with the only exception: no AC, which is almost a neccesity during the hot summer months. The two fans provided aren’t nearly enligt to stay cool. Other than that: comfortable beds, nice shower pressure, swift and easy check-in and great location right in the middle of old town with walking distance to pretty much all parts of the city. Would very much reccomend! We had a wonderful stay in Palma. The apartment is in very center of the old town and was clean and comfortable and kitchen had all necessary facilities for cooking. We recommend a visit to Mercat de I'Olivar where you can eat and buy all kind of delicacies. Victoria was nice and helpful. We can recommend this apartment to others. Wir haben uns in der schönen Wohnung sehr wohl gefühlt. Sie ist hell , sauber , hübsch eingerichtet und sehr gut ausgestattet . Wir wurden sehr herzlich empfangen und direkt mit hilfreichen Tipps versorgt. Der ganze Ablauf war sehr unkompliziert. Sehr nett war auch der flexible check out!! A lovely apartment in an ideal location - shops, bars and restaurants on your doorstep with the beach a 10minute walk away and the gorgeous cathedral only a 5 minute stroll. The apartment has all the usual amenities and well decorated with a modern feel in a traditional building. As the surrounding streets are pedestrianised Merce met us at the nearest square and helped us to the apartment despite the late hour of our arrival. She gave us all the information we required for a great vacation and we definitely intend to return. We have visited Majorca many times and have never been to Palma thinking it would be just a city but it has so much to offer and is a perfect place to visit for a weekend city break. Clean and central for old town with everything you need. Good contact with Victoria and a warm welcome from Merce who showed us to the apartment and gave very good directions for the supermarket etc. The only downside to the apartment is the fact it did not have air conditioning as this is included on the web site under amenities for the apartment. Two fans are provided but are not sufficient for the temperatures experienced this summer. 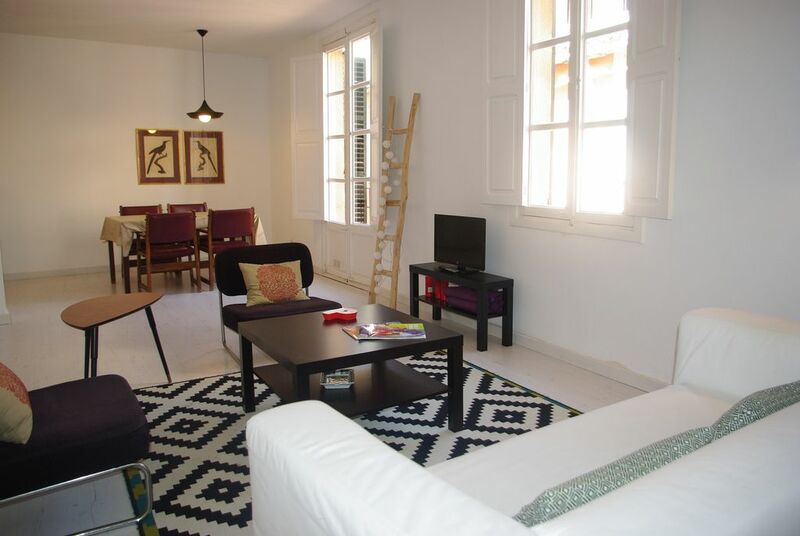 We had a wonderful stay for 3 nights at this apartment, located right in the centre of Palma's old town. Victoria was really helpful when we arrived, showing us how to get to the Mercat D'Olivar and some of the other local features. The apartment was really well-equipped, would definitely recommend it to anyone coming to Palma!